65 year old s/p phacotrab with MMC 3 weeks prior to her presentation with 20/60 vision/IOP at 18 mm Hg. What do you see? What other conditions do you see similar picture? How would you improve the vision? 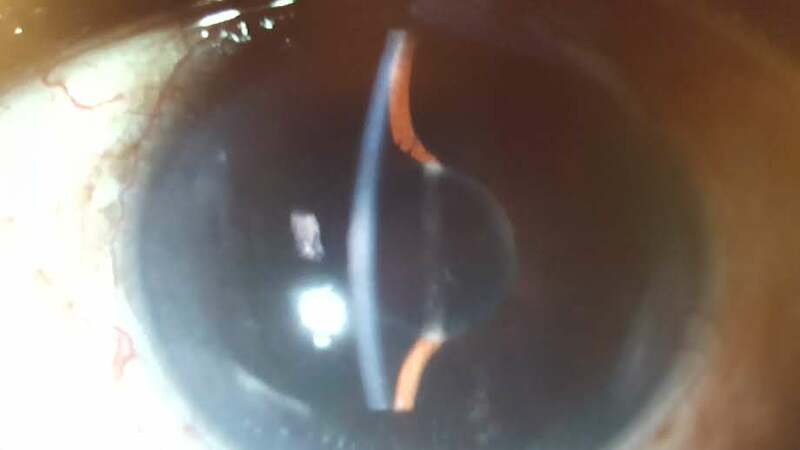 Here is a classic eye with iris bombe from a pupillary membrane that led to both decrease in the vision and pupillary margin adhesions - this causes the aqueous to be trapped under the iris, pushing the iris forwards , this leading to iris bombe. If left untreated, will lead to angle closure and continued increase in IOP. Treatment consists of YAG PI to resolve the iris bombe and removal of pupillary membrane removal -with a 30 G needle on healon at the slit lamp and inject 0.05 cc of kenalog to prevent recurrent pupillary membrane formation. Difficult to tell from the picture. The chamber looks formed, although there seems some anterior bowing of pupil. There are a couple reasons for decreased vision: anterior capsular membrane formation, corneal edema, and macular edema. Since we do not see any retina pictures, I assume the macula is normal. Given normal pressure I would continue pred forte and see if vision improves in a few weeks.